So, Trump is Transitioning, and the Dems are so very much not. That's pretty much where the wondering begins, this Wednesday. For reasons known only to them, 134 of the Dems in the House chose 76-year-old Nancy Pelosi to continue in the role of House Minority leader, while only 63 of them thought someone else would be better. The other two top party leaders, 77-year-old Steny Hoyer (Minority Whip) and 76-year old assistant to the leader James Clyburn, were unopposed. Dear lord, did the Dems learn NOTHING this past year? If the leaders of your party are all on the verge of 70, or much older, do you think you've got your finger on the pulse? Is the best person to understand what 18 - 34 year olds want really their grandmother? I mean, it used to be Father Knows Best - but the Dems apparently think Grandfather Knows Best? Yeah, I'm wondering about that. ...my level of frustration came from the idea that we're going to have, for two more years, the same conversation as we've been having since 2010 (when the Dems lost 63 seats and the House Majority in the mid-term election). And I think the level of frustration in our caucus is as great as I've ever seen it And it's time to do something about it, not just talk about it. Because now we're not even the national party. We're a coastal party. And we've got to move forward. If we're not going to get voters in Ohio, Wisconsin, Michigan, Minnesota, go back down south. When I first got in Congress, we had members from Tennessee. We've got to go back there and campaign and get those folks back in the fold. He added the comments below, after addressing issues of how the Dems slice all of the demographics and don't unify them, but talk about them and treat them as individual groups. But the reality of it is our message has been wrong. But we can't keep saying, "Oh, we got the message wrong, and so please forgive us." We've been getting the message wrong since 2010. We've got to get the message right. We've got to have the right messenger. And we've got to have someone who can not just go on MSNBC, but go on Fox and Fox Business and CNBC, and go into union halls and fish frys and churches all over the country and start a brush fire about what a new Democratic Party looks like. I wonder, why didn't that message resonate with House members? Are they too afraid of losing Pelosi's support and money? Is she that helpful to them in their campaigns? That's not the case here. I'm in New York's 24th district, which is very competitive - or was, anyway. We actually had someone hold the seat, for the first time in several years. But during the race the last few cycles, there was one name that was mentioned in campaign ads more often even than the candidate: Nancy Pelosi. As in, So-and-so will vote with Pelosi, with Nancy Pelosi. 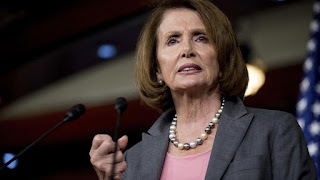 Pelosi, Pelosi, Pelosi, PelosiPelosiPelosi until I practically forget who's actually running. It's that bad out here, and she's a perfect target for the Republicans, as indicated by this 'congratulatory' tweet from the RNCC Communications Director. Continuing to have her in a leadership position means the opposition doesn't even have to talk about issues or anything -- just mention Pelosi and let the the rest just happen organically. I wonder if they know that? Or how they couldn't know that? Or does it only happen here? As much as I'm disappointed in the outcome of the election, I think I'm even more disappointed in the Dems, the party apparatus, their refusal to get with the program, and with today's vote their refusal to do anything more than talk about moving forward. Talk is cheap. Actions speak louder than words. 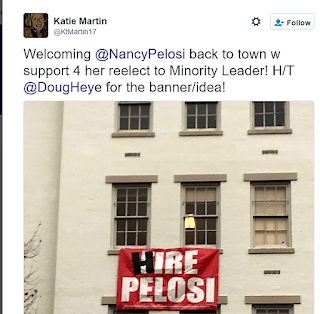 Nancy Pelosi got re-elected House Minority Leader. The Dems are in trouble - no wondering about that.